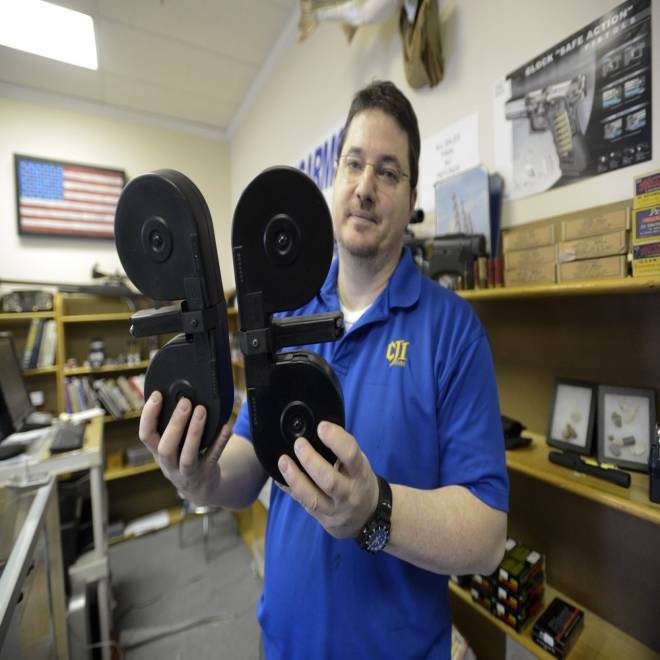 Ron Moon, co-owner of CJI Guns in Tucker, Ga., holds a pair of 100-bullet-capacity magazines for an AR15 assault style semi-automatic rifle on Wednesday. Anticipating staunch resistance from gun-rights groups to any effort to ban assault-style rifles, some pro-gun control lawmakers are instead trying to leverage the national outrage over the school shooting in Newtown, Conn., to enact federal legislation outlawing high-capacity ammunition clips. House Democrats, emboldened by President Barack Obama's call Wednesday for quick, "concrete” proposals to curb gun violence, are pushing House Republicans to quickly consider a ban on high-capacity clips. The move follows the massacre of 20 schoolchildren and six adults on Dec. 14 at Sandy Hook Elementary school. The gunman, 20-year-old Adam Lanza carried three guns, primarily using a Bushmaster XM-15 — an AR-15/M4-type rifle -- which police said was fed by 30-round magazines. He also was armed with a Glock 10mm handgun and Sig Sauer 9mm handgun. Although authorities didn't reveal the models of those weapons, both of those handguns allow high-capacity clips -- including 15-round magazines for one model of 10mm handgun that's sold by Glock. The bill’s list of co-sponsors this week grew from 113 to 135, according to a spokesman for Rep. Carolyn McCarthy, D-N.Y., the measure’s author. In 1993, a man armed with a gun and several 15-round magazines shot and killed McCarthy’s husband, Dennis, aboard a Long Island, N.Y., commuter train. Five others also died and 25 were wounded. From 1994 to 2004, high-capacity ammunition magazines were illegal as part of the Federal Assault Weapons Ban, but that provision lapsed when the legislation expired. Congressional Democrats have made several attempts to similar legislation barring possession of rapid-fire assault-style weapons since then, but those efforts have failed. Legislators also have pushed legislation banning specific types of bullets – with one notable success: In 1986, President Ronald Reagan signed legislation that outlawed armor-piercing "cop-killer" bullets. But other recent ammunition-cutting proposals have failed to gain traction in Congress. Last summer, a bill filed Lautenberg and McCarthy sought to significantly curb the ability of Americans to buy unlimited amounts of ammunition via the Internet. That bill never made it beyond the Senate Judiciary Committee, a spokeswoman for Lautenberg said this week. So in a country where the right to bear arms is held sacred, firearm foes are refining their pitch to focus on the delivery mechanism. One of their main talking points is asking why such high-capacity clips are necessary. “I've been a hunter all my life, and there's no reason to have a magazine that holds 30 shells,” said Rep. Mike Thompson, D-Calif. “Call it what it is: an assault magazine. And we don't have any reason to assault anyone in our communities, in our neighborhoods. ... Why do you need 30 shells in a magazine?" “Who needs these? The answer is sports shooters,” responds Mark Walters, co-author of "Lessons from Armed America" and host of a syndicated radio show “Armed American Radio." “For example, if you were target shooting or practicing for an upcoming (shooting competition), it’s nice not to have to change magazines on a regular continual basis." In the wake of the Sandy Hook Elementary School shooting, the National Rifle Association held a news conference in Washington, D.C, on Friday and blamed the media and video games for cultivating a culture of violence. What’s more, many ranchers use firearms like AR15s — manufactured to carry 30-round magazines — to protect their herds from coyotes and clear their land of prairie dogs, added George Hill, an employee at Basin Sports in Vernal, Utah. The talk of banning “assault magazines” emanating from Washington appears to be driving sales of the high-capacity clips, according to Walters and Hill. “I came in at 8 this morning and I have been non-stop on selling AR15s and ammo. Nonstop,” Hill said Wednesday afternoon. “Those (30-round clips) have been going out, and I’ve been selling those two, three, 10 at a time. Everybody’s worried about the politics behind it and that’s generating a lot of these sales. They’re worried about it being banned. While Walters and Hill each oppose the proposed ban on high-capacity clips in principle, they argued as well that such a crackdown won’t slow gun violence in this country. They note that gun ownership has increased over the past decade, with the number of instant criminal background checks conducted by retailers required by federal law rising each year. In November alone, more than 2 million such point-of-sale investigations were performed nationally on people seeking to purchase firearms — the most in any single month since federal officials launched the National Instant Criminal Background Check System (NICS) in 1998, according to the FBI. By comparison, gun retailers and federal authorities completed 842,932 background checks in November 2003. “There are millions of rounds of ammunition already in the public’s hands — high-capacity or standard-capacity magazines already in the public's hands,” Walters said. “If they pass this ban, in the days prior to the date (it goes into effect), stores will sell 10 years’ worth of these capacity magazines. “But beyond that, it’s irrelevant. A seasoned, experienced firearms enthusiast, including myself, can change a magazine out, including a tactical reload, in under a second,” Walters said. Moreover, such ammunition doesn’t degrade over time, he added. “People have been making ammunition themselves since the 1880s. That’s something anybody is capable of doing with a little bit of know-how,” Hill said. "Those kinds of bans are like throwing a steak on the grill for like 10 seconds and calling it cooked. It just looks like it’s cooked but it’s not.